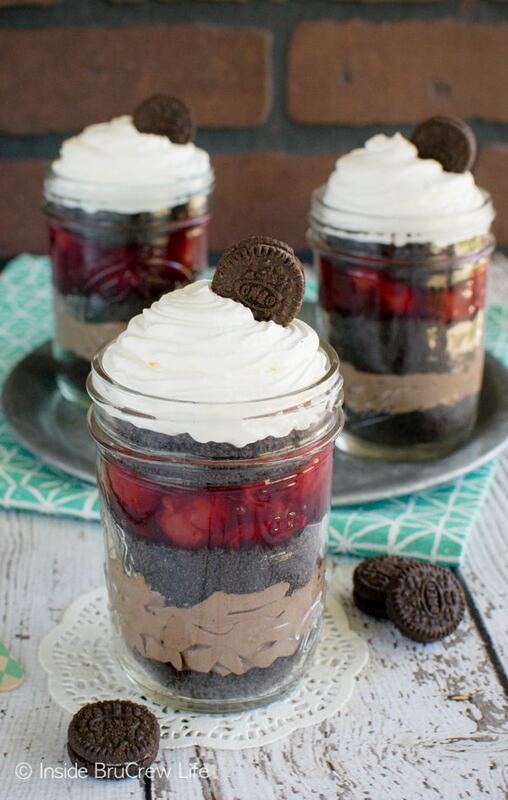 These Cherry Chocolate Mousse Parfaits have layers of pie filling, cookies, and a creamy chocolate mousse cheesecake. Grab a spoon and get ready to dig in! 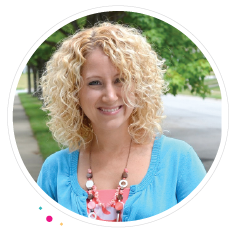 *I am partnering with Lucky Leaf this year as a blog ambassador bringing you delicious recipes using pie filling. PIN IT NOW TO SAVE THE RECIPE FOR LATER! My husband goes in spurts with his healthy eating. Most days he can say no to the desserts and treats that I pump out of our kitchen. I wish I had that kind of willpower. A few months ago he decided that he was going to give up sugar and carbs for a while. Yes, right as I was in the middle of recipe testing for the cookbook, he stopped eating sweets. That limited my reliable taste testers by quite a bit. Thank goodness I have willing friends at church who are always ready to step up to the dessert eating challenge. One night we stopped at the store to pick up a few ingredients I needed. Apparently the lack of sugar was finally starting to get to my hubby because while I was grabbing some cans of pie filling and cookies, he was looking over the chocolate baking bars. He finally decided that he was going to buy one of the dark chocolate bars and just have a small taste. So, he grabbed the bar with the least amount of sugar. Ok, it was actually one without any sugar in it, so really just cocoa powder in solid form. Yup, the 100% cacao unsweetened baking bar went into the cart. I tried to warn him! I tried to tell him that this was a bad idea. But does he listen to me? Sometimes yes, but not today. As soon as we got in the car, he pulled the chocolate bar out of the bag and opened it. Again I tried to warn him this was not going to end well, but he went ahead and popped a chunk in his mouth. Like I said completely unsweetened baking bars do taste just like cocoa powder…my husband totally believes me now. Before we even left the parking lot, he had to pull over to spit it out. Yes, I was hysterically laughing in the passenger seat. I couldn’t help myself. His face was priceless! Now something my husband does really enjoy from time to time is a chocolate and cherry treat. 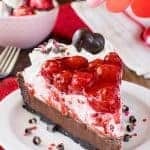 He absolutely loved this no bake cherry swiss rolls cake, so as I was thinking through another pie filling dessert, I knew chocolate and cherry had to happen again. I love that every time I open a can of filling, it is going to be thick and rich and full of 100% fruit. Believe me, I usually eat a few spoonfuls as soon as each lid is off the can. 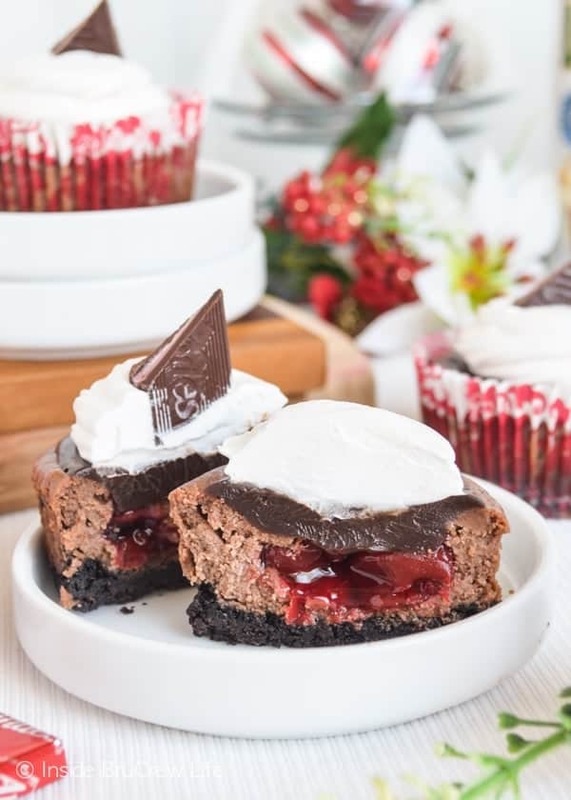 For these easy no bake cherry chocolate mousse parfaits, I layered a creamy no bake chocolate cheesecake with cookie crumbs and a thick layer of cherry pie filling! 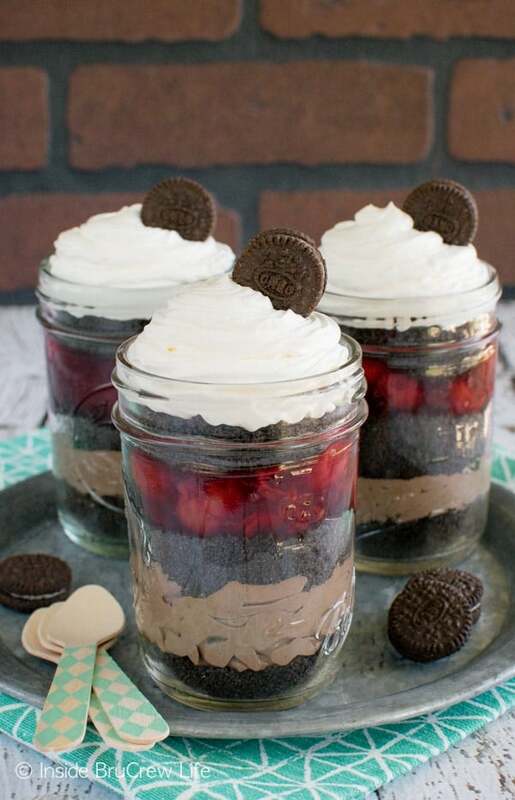 This is the perfect summer dessert for parties and picnics because you can layer everything in mason jars and put a lid on the jars for traveling. 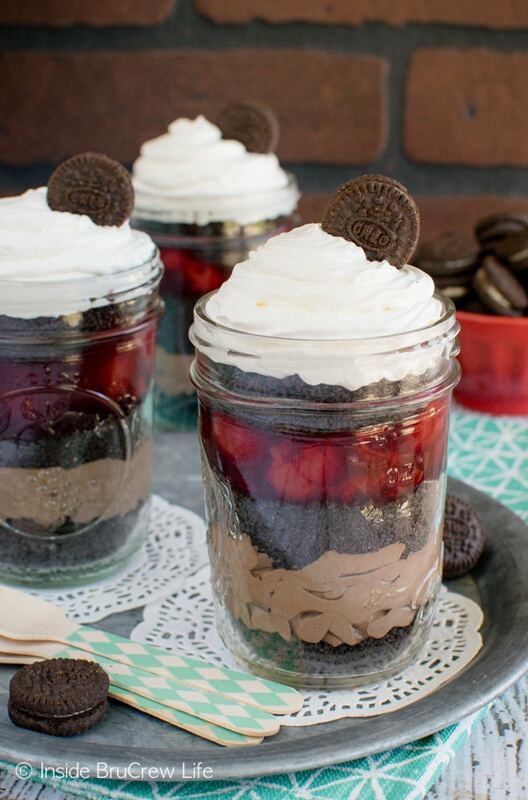 These Cherry Chocolate Mousse Parfaits have layers of cookie crumbs, chocolate cheesecake, and cherry pie filling. 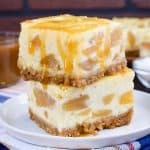 No bake desserts are great treats to share at summer parties and picnics. Place the cookies, cream included, in a food processor and pulse until they become crumbs. Divide the crumbs evenly into 3 bowls. Beat the cream cheese until creamy. Add the hazelnut spread and cocoa powder and beat again until smooth. Fold in 1 1/2 cups Cool Whip gently. 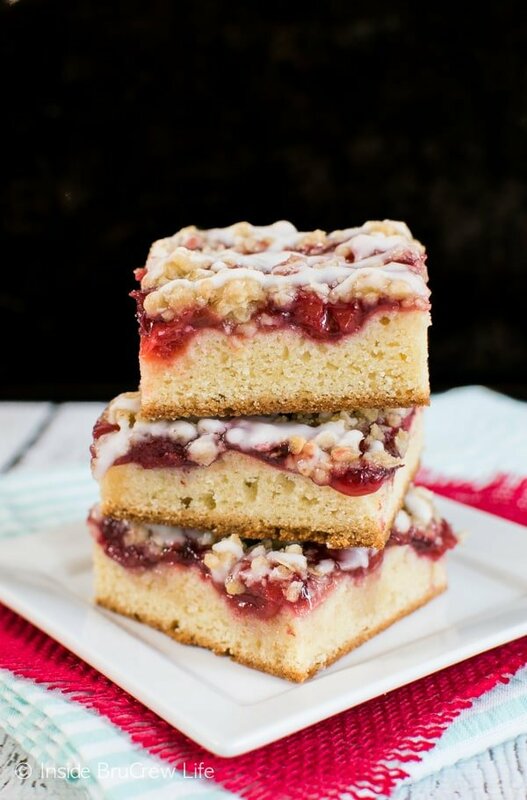 Divide one bowl of cookie crumbs evenly into 8 - 8 ounce jelly jars. Spoon or pipe the chocolate cheesecake mixture evenly on top of the crumbs. 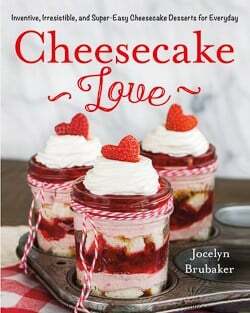 Divide another bowl of cookie crumbs evenly over the cheesecake filling. Spoon the cherry pie filling evenly into the jars. Finish off the layers by sprinkling the last bowl of cookie crumbs on top of each jar. Swirl Cool Whip on top of each jar and top with a mini cookie. Refrigerate until ready to serve. Makes 8 parfaits. 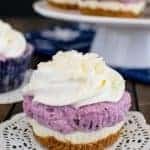 *If you are traveling with these parfaits, do not swirl the Cool Whip over the top of the jar because you will need room to put the lids on. So fun and easy! I love these! I love the Nutella in these parfaits. They look so good! 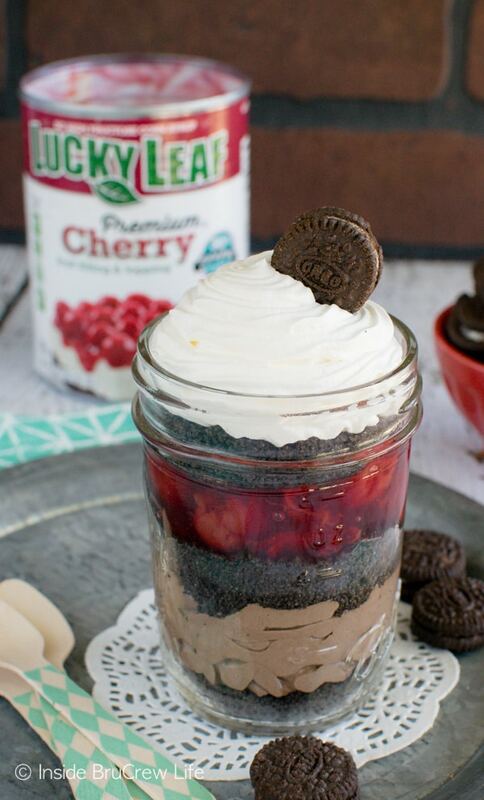 Anything in a mason jar is a perfect dessert! I love how simple they are to put together! I agree…desserts in jars are just too fun! Plus, simple and summer just go together so well. Wow, now that’s a dessert! 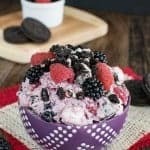 Love this no-bake dessert for a great go-to when it is too hot to bake, and sympathize with Jeremy about the chocolate bar……did the same thing once, and it is truly disappointing when you just knew it would be a delicious healthy fix, and it lets you down HARD!!! Keep up the amazingly tasty things going through your mind, and thank you for sharing!!! Honestly, I stop at the 85% mark with dark chocolate. Anything above that just tastes gross. But I gotta laugh at your husband, trying it even though you warned him. We all make that mistake once in life! These are adorable. And delicious. Adorably delicious! Hahaha! I don’t think he will make that mistake again. But seriously, he should have listened…I mean I do know my chocolate! 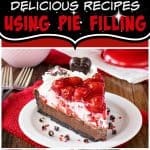 Huge fan of cherry pie filling and chocolate… of course! These look so great! These look so good! Perfect for summer picnics! Good thing there is a lot of layers here. I want them all to myself! I’m not going to share how many of these little parfaits I ate…let’s just say it wasn’t one. LOL! 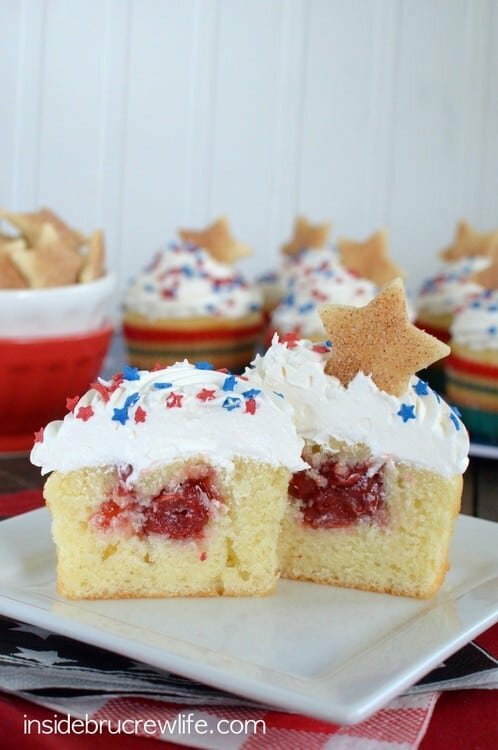 I love simple desserts like this for the summer months! These would be perfect for a barbecue! 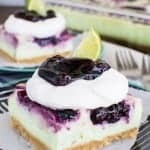 I’m with you on easy desserts for the hot summer months! How long would these last in the refrigerator? They should be fine for a few days in the fridge. After about 4 days the cookies start to be super soggy.